Preheat oven to 375 degrees. Brown turkey with spices, Worcestershire and hot sauces in a large skillet over medium heat. When about half way cooked, mix in pureed butternut squash. Cook for about 3 more minutes. Add ketchup and let cook on low heat until meat is done. 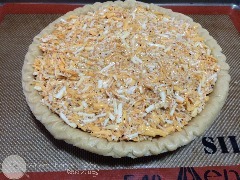 Add cooked turkey to frozen pie crust. For the topping, whisk 2 eggs, milk and Worcestershire sauce together until well combined. 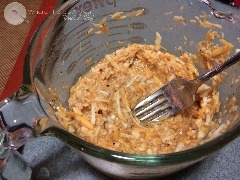 Measure 1 ½ cups shredded cheddar cheese in a large measuring cup. Pour egg mixture on top of the cheese in the large measuring cup and mix thoroughly. 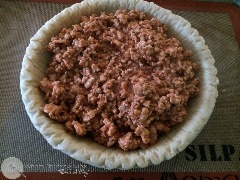 Evenly spoon topping over the meat mixture in the pie crust. Bake at 375 for about 25-30 minutes. Serve hot, or freeze individual slices for a later time. *Note: You can either use fresh, canned or Green Giant's Veggie Blend-In's (my review of Veggie-Blend In's) butternut squash. To make fresh pureed butternut squash, half the squash lengthwise. Use a spoon to scoop out all seeds. Add ¾ cup water to a large glass baking dish and place squash inside, facing down. Cover with foil and cook on 400 for about 35-40 minutes. Squash is done when it is fork tender. Once squash is cooked, spoon out the inside into a blender. Add 1 tablespoon chicken broth to the squash, and puree in blender. Use immediately or freeze in an ice cube tray. Each ice cube is roughly one ounce, so this makes measuring after it is frozen very easy. Special Note: If you are cooking for someone with gluten intolerance, substitute the standard piecrust for a gluten free one. Reheating Instructions: Preheat oven to 350 degrees. 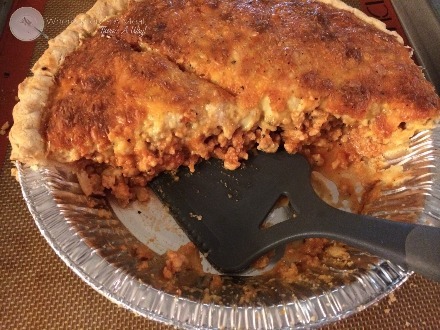 Place frozen cheeseburger pie in a greased glass baking dish. Cover with foil and bake for 25 minutes or until warm. A Cheeseburger in a Pie? Oh my! Yes, that's right, everything you love about a cheeseburger in a pie, no grill necessary. Using lean ground turkey and a hidden serving of veggies, it's much healthier than it's traditional counterpart, but you would never know it! If you want to make it even more drool worthy, try adding some crumbled turkey bacon (just make sure it's nitrate free), yum. Craving a cheeseburger, but don't want the guilt? Where there's a meal, there's a way!